Roundworms are one the most common intestinal parasites of puppies. Even puppies that come from pristine kennels and environments often develop roundworms because it is found in almost all puppies at birth. There are several types of roundworms, technically called nematodes, but the species Toxocara canis most commonly affects dogs. Roundworms are passed in the stool or vomited, and look like masses of spaghetti. 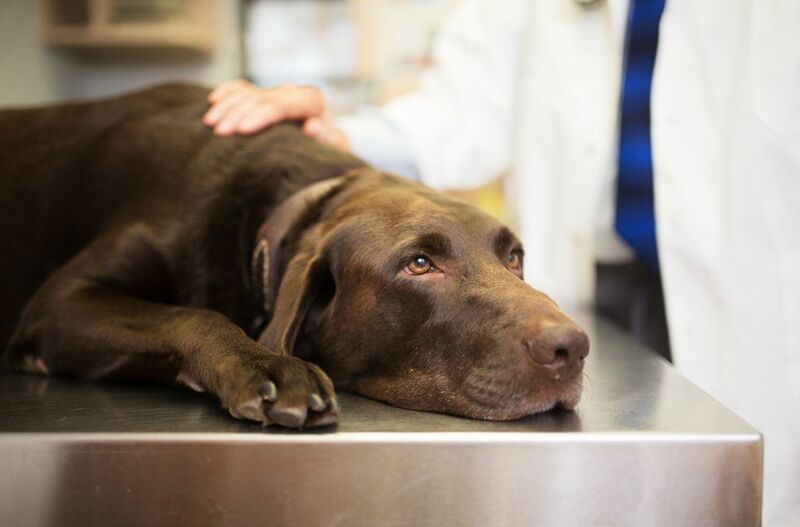 Dogs can become infected in four different ways. Puppies may be infected before they are born when immature worms the mom-dog harbors migrate to the uterus. Puppies may also contract roundworms from nursing the mother's infected milk. The parasite can also be contracted when a puppy or adult dog swallows infectious larvae found in the environment, or by eating an infected host like a mouse or bird. When a puppy swallows infectious eggs, the larvae that hatch in the intestines later migrate to the liver and lungs. They are coughed up and swallowed again, and then mature once they return to the intestines. The parasites grow into one to 7-inch-long adult worms. Mature females can lay 200,000 hard-shelled eggs in a single day, which pass with the stool and can live in the environment for months to years. Eggs hatch into infectious larvae, completing the cycle. Older dogs that swallow infectious larvae are more resistant to the worms, and their immune system tends to arrest the worm's development. Such larvae simply stop developing and remain wherever they happen to alight. In other words, they can lodge in the pet's muscles, kidneys, brain, or even the eyes. In male dogs and females that are spayed or never bred, the larvae remain permanently frozen in time. But when a female dog becomes pregnant, the same hormones that promote the unborn puppies' development also stimulate the worms to grow. Immature roundworms begin again to migrate and typically cross into the placenta or the mammary glands to infect the puppies before or shortly after birth. Roundworms are rarely life-threatening, but massive infestations may cause intestinal damage, or rarely bowel obstruction or even rupture. More commonly, roundworms interfere with absorption of puppy food.​ The adult worms live in your dog's intestinal tract where they eat the partially digested food meant for your dog. This can lead to malnourishment in a small puppy, and your dog may show weakness, weight loss, and reduced growth. Puppies with roundworms often have a potbellied appearance. They may also develop a dull coat since the worms take away nutrients that keep the coat looking healthy. Heavy worm loads can cause diarrhea or mucus in the stool. Puppy owners typically diagnose the worms themselves when they see the spaghetti-like masses passed in the stool or vomited. Your veterinarian also can diagnose roundworms by examining a sample of the puppy’s stool under the microscope and finding the immature eggs, which confirms adult worms are present in the intestines. Veterinarians usually prescribe medication for roundworms as a matter of course. These treatments are considered safe even in quite young puppies. Many heartworm preventatives also protect against roundworms, since heartworm is a kind of nematode as well. This is important because roundworms can also affect children. Children may be at risk for infection with Toxocara canis, primarily from accidentally ingesting infectious stages of the worm. This most commonly occurs when the kids taste or eat contaminated dirt. The parasite causes a disease in humans called visceral larva migrans in which immature worms never reach maturity, but simply migrate throughout the body. Symptoms include fever, anemia, liver enlargement, pneumonia, and other problems. Because of this human risk, the Centers for Disease Control (CDC) recommends that all puppies and their mothers undergo deworming treatments, whether diagnosed with the parasite or not. Your veterinarian can provide a dewormer that is safe and effective to use. These precautions, along with simple sanitation procedures, will protect both puppies and human family members from roundworms. Clean up feces from the puppy's yard at least once a week, and prevent young children from playing in the dog's "toilet area."